If you try to add visual editor to comments form you will discover another problem. TinyMCE isn't designed to be moved around in DOM once initialized. WordPress comment-reply.js code does just that when you click on reply/cancel reply link on threaded comments powered WordPress site. In this article, besides showing you how to add visual editor to your comments textarea, I'll present two ways to modify comment-reply.js source code to remove TinyMCE before moving comments form in DOM. I will also present ways to add TinyMCE back once your comments textarea has settled on new place inside DOM after you click on reply/cancel reply link on your comments board. For wp_editor() customization please take a look at reference documentation or its source code inside wp-includes/class-wp-editor.php. Also keep in mind that visual text editor lives inside div tag and that theme authors usually place textarea inline element inside paragraph tag or similar. Since we have replaced this inline element with block level element like visual text editor, your theme CSS might require some adjustments. And here's inside of our your_theme/scripts/comment-reply.dev.js. You can place the same thing inside your_theme/scripts/comment-reply.js but you should minify it first using Closure Compiler Service or similar tool. I wont get into this code details because I've commented important parts. Long story short, when we do wp_editor() besides other stuff this enqueues editor.js that supports TinyMCE and Quicktags by allowing you to shuffle between them and similar. I've used function switchEditors.go from editor.js to add visual editor back after it has been moved in DOM. I'm also saving currently selected editor tab (Visual or HTML/Text) into variable to be able to restore proper one. This code has worked 100% percent fine so far, if you encounter any problems please reply. Second solution is built on the idea of Reuben from Revood.com. His code doesn't work fine for me because he didn't take into an account that he must do some magic when user clicks cancel reply link. So here it is my second solution. Basically we use comment_reply_link filter to make clicking on reply link call our own your_theme_editor.move_form() function instead of WordPress comment-reply.js AddComment.MoveForm() function. This function of ours then does removal of TinyMCE if necessary and then calls WordPress comment-reply.js code to do its thing. Also our own code will modify cancel reply event handler to first remove TinyMCE before moving form in DOM after clicking on cancel reply link. Following code is to be placed inside visual_editor.dev.js, minified using Closure Compiler Service or similar tool, and then placed inside visual_editor.js. If you would like to see the end results of this code you can scroll down a bit and leave your comment to this article. TechyTalk.info is currently using my first solution to comment reply not working with TinyMCE problem. If this procedure looks too complicated or you just do not have time to do it your self, I can be hired to modify your theme to add TinyMCE and Quicktags visual editors to your WordPress comments form. Nice article. would this work if I need the wp_editor in the admin through ajax call? 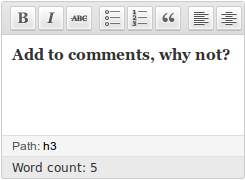 Hi, I really like add visual editors to WordPress comments form! But your post is difficult for a beginner like me. Can you create a clip to illustrate this article? If you can, people will thank you very much! Of course I would be very grateful to you! This article is already one of the longest articles on my blog, so I don’t plan on adding more code to it. You can always click that services link in upper right corner of this site and hire me to implement this on your site. I’d love to hire you for a project related to this thread, however, the Contact Form 7 plugin seems to be not working properly when I try to message you through your services and contact page. that sentence just means that if theme author hasn’t used plain comment_form() template tag, steps to implement visual editor depend on the theme in question. It might be easier or harder than steps outlined in this article. comments.php file you’ve linked to uses comment_form() template tag but it overrides all arguments so steps from this article don’t apply. To implement TinyMCE you should modify $custom_comment_form to output visual editor instead of textarea. Thanks to the enthusiastic help from you.I am not a professional editing code, I rather difficult to access with your article.But nonetheless could say I was successful 50%. I continue to surf the web and I’ve found a plugin that I have used before: CKEditor For WordPress, but now it’s wonderful in spite of some minor problems, provide an editor of frames per opinion, and of course in the article editor. Thanks for your post, is the only one with full explanation of all concepts. Two points that I can´t correct. Any help will be appreciate. When click Replay bottom of a comment the form doesn’t move under the comment, stay at the end of the page. Really great post. I used this in parts and tried to provide a complete post like editor for authors comments. I stumbled across a strange user right or capability issue that I couldn’t resolve so far. Please see this forum post on wordpress.org. WordPress 3.5 media uploader is a new piece of code and it might contain bugs. You should report that bug to WordPress guys. Thank you, this is what I’m look for in several years…. I just want to add syntax crayon into comment, and it works now with this method! First and foremost a big thank you for this solution, it almost works perfectly. I just had a small question. The form for a comment on a buddypress update is not appearing. Is there a workaround ?